The Atlantic Seafloor Partnership for Integrated Research and Exploration, or ASPIRE, is a major multi-year, multi-national collaborative ocean exploration field program focused on raising collective knowledge and understanding of the North Atlantic Ocean. The campaign will provide data to inform and support research planning and management decisions in the region. Download ASPIRE logo (32 KB). Building on the successes of the 2012-2013 Atlantic Canyons Undersea Mapping Expeditions (ACUMEN), NOAA’s ASPIRE campaign will broaden both the geographic focus to include more of the U.S. Atlantic and the high seas and the scope of partnerships to include federal agencies, such as the Bureau of Ocean Energy Management and the U.S. Geological Survey, as well as international partners from the European Union and Canada. Initial ASPIRE fieldwork was conducted in 2016 and 2017, and NOAA Ship Okeanos Explorer will join partners in operating in the region from 2018-2020. A brisingid seastar rests on a small bubblegum coral in Hydrographer Canyon. 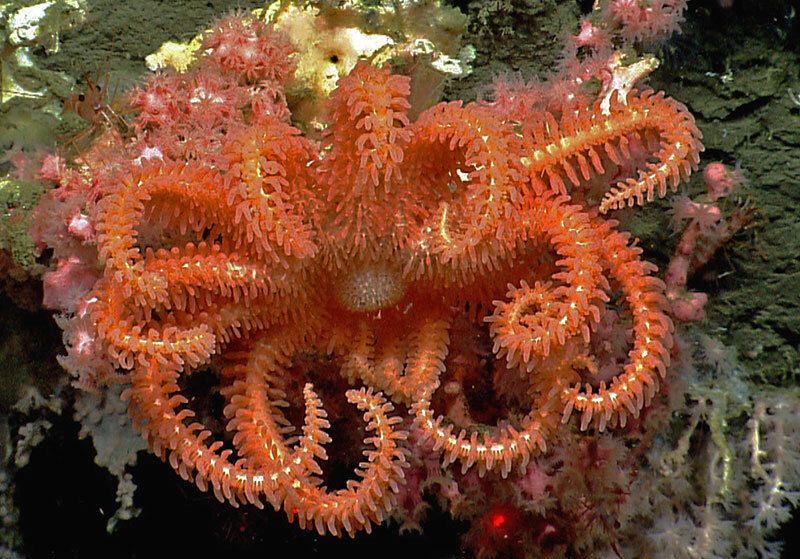 Image courtesy of the NOAA Office of Ocean Exploration and Research, 2013 Northeast U.S. Canyons Expedition. Download larger version (jpg, 1.2 MB). The North Atlantic Ocean plays a pivotal role to humankind, providing biological and geological resources, ecosystem services such as seafood production and climate regulation, and a route for trade and travel between Europe and the Americas. The countries bordering the North Atlantic have a long history of scientific collaboration to explore and study their shared marine resources. With increased globalization, efforts to understand, conserve, manage, and defend the maritime commons have become an essential shared responsibility. However, we have only begun to understand the North Atlantic Ocean’s ecosystems, resources, and oceanography. Much about the seabed bathymetry, geology and mineralogy, and trans-Atlantic connectivity of biological communities remains unknown. With the signing of the Galway Statement on Atlantic Ocean Cooperation in 2013 and the Atlantic Ocean Research Alliance’s deep-sea science and exploration efforts, there is significant momentum within the international community to cooperate on integrated exploration and research. 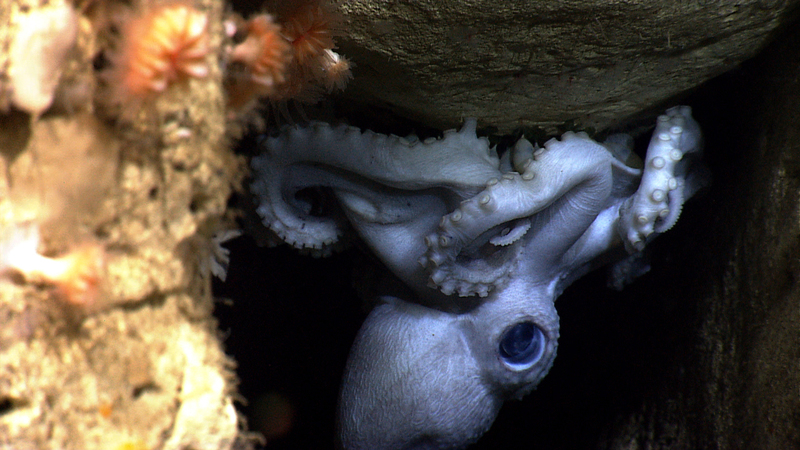 An octopus mother protects her eggs in Hendrickson Canyon. 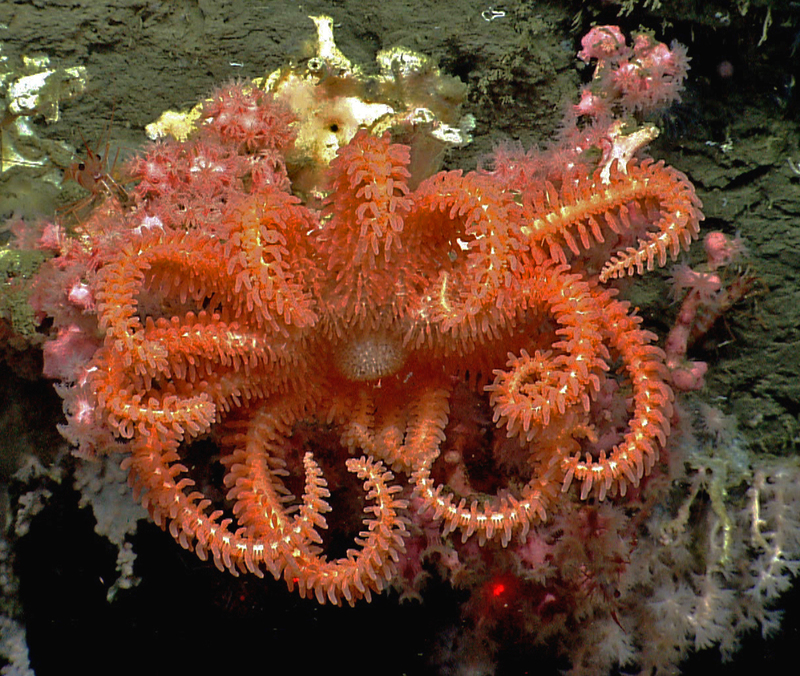 Image courtesy of the NOAA Office of Ocean Exploration and Research, Our Deepwater Backyard: Exploring Atlantic Canyons and Seamounts 2014. Download larger version (jpg, 1.4 MB). The ASPIRE campaign will provide a foundation of publicly accessible baseline data to increase understanding of the North Atlantic Ocean. The effort will also provide critical information relevant to emerging blue economy priorities, including sustainable fisheries, offshore energy and marine minerals, coastal and offshore hazards, and marine tourism and recreation. Leverage international partnerships to conduct coordinated exploration and mapping of priority high-seas areas of the North Atlantic, including the Mid-Atlantic Ridge. Map of currently identified ASPIRE expeditions (2016-2019). Image courtesy of the NOAA Office of Ocean Exploration and Research. Download pdf of map (jpg, 395 KB). June-September 2017: One cruise on NOAA Ship Henry B. Bigelow used remotely operated vehicle ROPOS to explore submarine canyons along the Canada-U.S. boundary. Two cruises on NOAA Ship Pisces, including the National Oceanographic Partnership Program-sponsored interagency DEEP Sea Exploration to Advance Research on Coral/Canyon/Cold seep Habitats (DEEP SEARCH) mission, used AUV Sentry to explore coral, canyon, and methane seep habitats offshore of the Carolinas. May - December 2018: NOAA Ship Okeanos Explorer will visit deepwater areas off the southeastern U.S., U.S.-Canada transboundary area, and U.S. Caribbean. The DEEP SEARCH team will use R/V Atlantis and human occupied vehicle Alvin to further explore off the mid- and south Atlantic U.S. coastline. 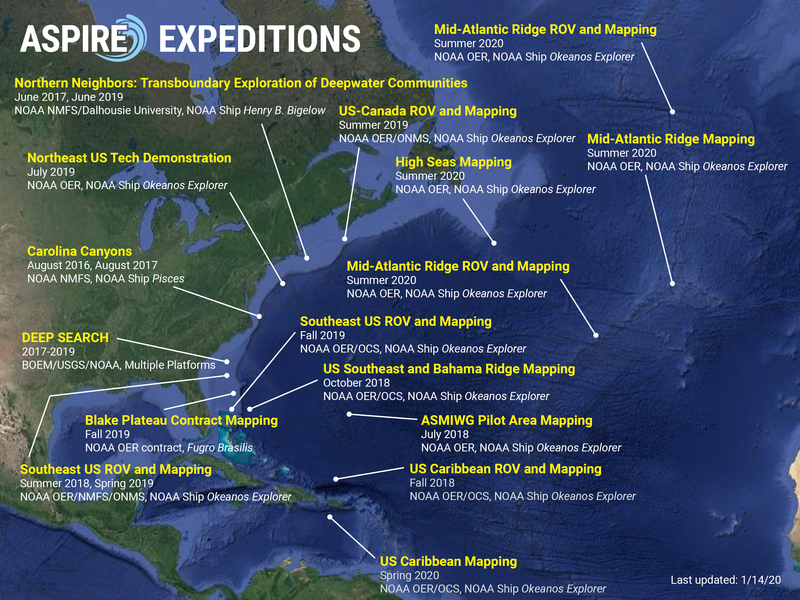 April - September 2019: In 2019, NOAA Ship Okeanos Explorer will continue to focus on the North Atlantic and will expand its focus to likely include work on the Mid-Atlantic Ridge. Other work in support of ASPIRE will include a DEEP SEARCH expedition on NOAA Ship Ronald H. Brown. 2020: Field activities are anticipated to continue in both U.S. and international waters, with a continued focus on the Mid-Atlantic Ridge and the potential for expanded collaboration with international partners. For more information about ASPIRE plans or to discuss potential regional partnerships, please contact Scott France at france@louisiana.edu.